By the end of the evening, the glowing faces speak for themselves, “Ya done it again! Tonight is phenomenal!” The way to do it is to hide in the shadows and let the musical stars shine brightly; we are so gifted in Hawai’i to be witness to the kind of talent that grace our stages and share music of the heart for us to enjoy. And so it was with LT Smooth (Leon Toomata), Bruce Collins, Pati Taulaulelei, and Heidi the hula dancer. 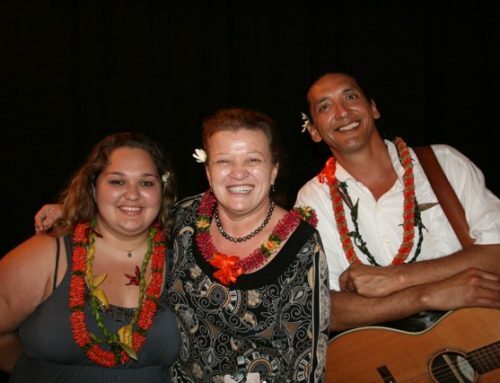 Known as the group “Vakanui” they took us on a musical journey that made us laugh, swoon, cry, dance, cheer and fall in love all over again with our significant other, old friends and new friends. For three wonderful hours we were transported into a place of musical joy — we moved from island to island, sat in church with missionaries, danced in the lounge and whistled and yelled with appreciation. The ukulele and hula hour ended early with instant graduation as all the players and dancers had to go up on stage before they got cold feet and perform for the audience to Beautiful Kaua’i. Instant gratification … good move! Another good move, LT invited Ed Blanchet up to the stage to represent the audience as LT greeted him with “honge” or touching of the nose and sharing of the breath of life, love, joy and peace. Ripples of nervous laughter quieted to a subdued and respectful silence as the audience witnessed the cultural greeting. 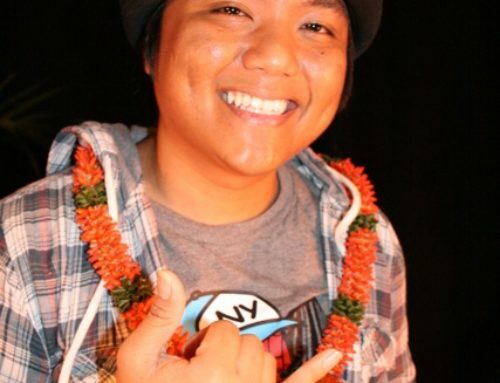 Before coming to Kaua’i, LT called his Mom to tell her of his trip to Kaua’i; she told him to be sure to pray on the airplane and “plant the seed” of joy, peace and happiness. So he was here on this mission. Many songs were familiar as we have heard them sung by Bruddah Iz, Gabby, and countless other singers, but LT certainly puts his own spin on every song. When he took off on his guitar, all you could do was hold your breath. His life story is one of hope. “Close your eyes and think of how blessed you are,” said LT as he began talking about the Captain in the belly of the ship, feeling the slave, humming and weeping, “…and that was me chained up with ten years of cocaine…I had to clean myself up or die.” His voice hummed resonantly and as he sang the moving lyrics to Amazing Grace, Heidi stepped out in her black holoku and began to sign the words, bringing out goose pimples on my arm. LT’s voice resonated through the first verse and when percussionist Bruce Collins added his Samoan voice on the second verse, you could feel chicken skin on top of your goose pimples. As Heidi moved from signing into a hula, and the voices soared in harmony, you really had to close your eye and feel the blessings. Bruce is from Las Vegas and bass player Pati Taulaulelei is from Samoa; they all live in Kona and met in church. They play together every Sunday night right on the ocean where many supporters go to enjoy their music. Acknowledging his love for his Irish Dad, LT sang Danny Boy. His singing oozes with emotion. In fact, LT does not sing; he emotes the music….it just comes pouring out like a dam that just gave way. He pours his heart and soul into his music and everyone present can feel it. Bruddah Iz definitely influences LT as he does so many others in Hawai’i and around the world. To pay tribute to those who came before and paved the way for musicians of today, LT sang, White Sandy Beach and Somewhere Over the Rainbow, the Iz version known worldwide. Gabby’s Hi’ilawe, one of the most famous Hawaiian songs about the waterfall in Waipio Valley on Hawai’i Island was brought to life as Heidi danced about the gossiping birds, the lovers, the waterfall, and closed the song chanting an oli. Exotic Heidi is a vision of loveliness in her white flowing angel-like dress as she dances to the beautiful song, Beautiful Kaua’i, a song for the host island which was taught to the ukulele gang and hula dancers; it made us all appreciate the beauty of our home island all over again. LT liked playing with the audience as he was trying to take a poll of who was married long, very long, short, or not at all; he invited everyone to grab their spouse and dance in the aisle to Only Fools Rush in. This is really a dancing crowd because you don’t have to ask them twice, they all love holding, hugging, smooching, and moving their bodies to music. The talented LT plays 13 to 14 different instruments, but when he met and started playing the guitar eight years ago, he gained a new friend that does anything he asks it to. He loves the way the instrument is made, the contrast, the speed and especially the strings. Fingers flying up and down the fret, tuning it up, tuning it down, never pausing, his face mirrors the joy of playing as he played a song about the vaqueros in the 1800’s. For five minutes everyone held their breath as he played Desperado until finally everyone started clapping to the manic music … or burst. As he strummed the last chord, the audience stood up en masse and clapped, whistled, stomped and cheered. Standing “O”! To calm everyone down, LT played one of his favorite songs in a way that I’ve never heard it before. It took him a long time to record it as the song brought tears to his eyes whenever he heard it. The song honors the missionaries who came to spread their teachings. With LT, Pati and Bruce harmonizing the hymn E Holu Mea Nui, we were no longer sitting in a ballroom with clam shell chandeliers but transported into a place of worship surrounded by voices that cradled us in spirituality. LT once again showed off his amazing skill on the guitar with an instrumental titled LT Smooth. He acknowledged his band members — Pati who showed off on the bass and Bruce who could not show off too much on the cajon but hammed it up by doing body builder poses in between his drum beats . . . a percussionist with an extraordinary voice and a great sense of humor. No wonder he was invited along on the trip. LT honored musical greats whose music lives on for generations to come by singing the songs they made famous. Bruddah Iz is definitely one of LT’s idols. When LT first came to Hawai’i, he was dressed in a suit and tie. Not knowing how hot it was here, he was sweating like a pig. He heard Bruddah Iz singing Ahi Wela/Twinkle Twinkle Little Star. He closed his eyes and took it all in; it’s now one of his favorite song. 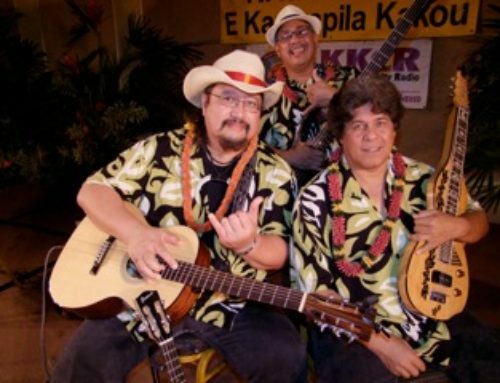 Composed in 2003 by Mickey Ioane and made popular by Iz and the Makaha Sons, Hawai’i ’78 is one of the most powerful and influential songs of the last half century. The three voices harmonizing the haunting melody with Heidi dancing the hula will certainly be an image that many took home with them. “What A Wonderful World is my Mom and Dad’s favorite song;” LT gave it the old Sachmo spin and many voices joined in to sing the upbeat song. “We lost a good sister in music,” said LT , acknowledging the sudden unexpected loss of one of the outstanding singers of our time. Heidi danced the hula with sign language as the three power voices rose to sing Greatest Love of All popularized by Whitney Houston. Of course no musical event with LT would be complete without a whole lot of rocking and rolling; it would have gone on all night had it not been for the hotel pumpkin hour . . . and so another wonderful night of musical sharing became history.